Fun to wear and available in a variety of colors and yarn styles, this crochet Lacy Camisole with pico edging is a great accessory for jeans, shorts, skirts, or many different styles. Wear alone or over a top. The bust line has a drawstring for both style and support. 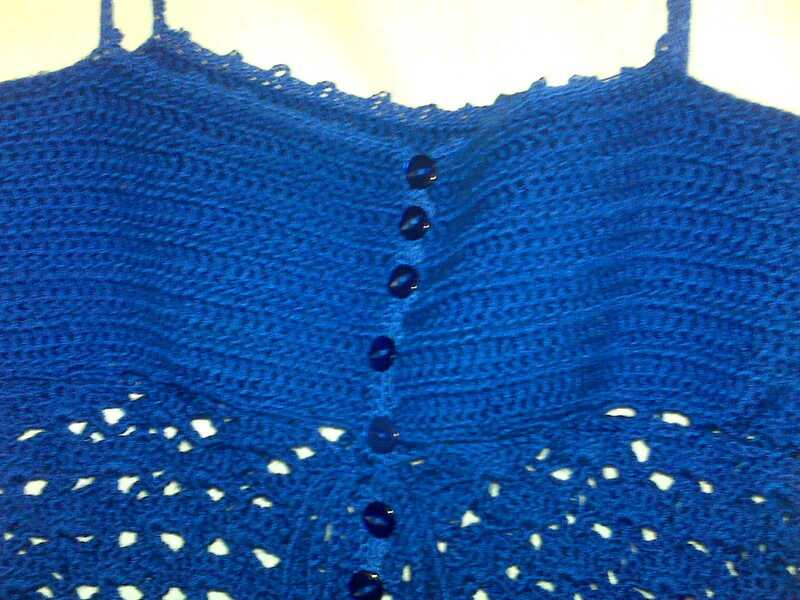 This crochet Royal Blue Lacy Camisole was created with LionBrand Microspun Yarn, which is available in a variety of rich, vibrant colors, and edging with Aunt Lydia's Classic Thread (100% mercerized cotton). 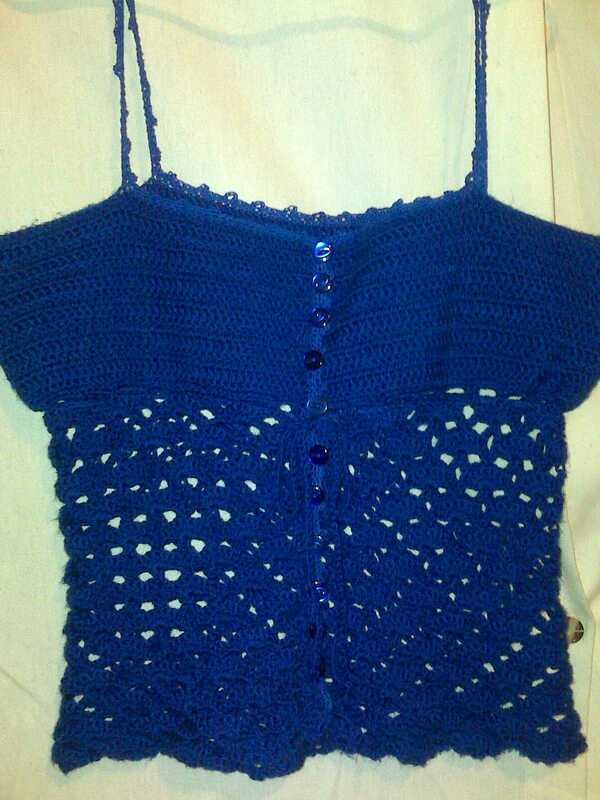 This is a favorite summer top, and I enjoy wearing this crochet top alone, or under a jacket/blazer, or over a short-sleeved button down shirt, tee or tank. Great, stylish and effortless last minute item to throw on for almost any event! 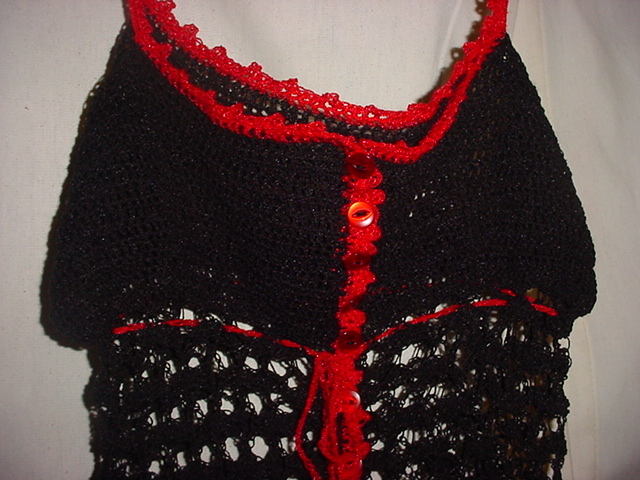 This black lacy camisole was crocheted with classic crochet thread (100% mercerized cotton) for a more sophisticated look or intimate occasion. Custom Size also available - e-mail us your bust and waste measurements to ensure cami will fit properly. Choose your own color(s)* and yarn style (MicroSpun, Cotton, or Crochet Thread). *Color selections will vary per yarn type/style. When ordering, select ONLY ONE (1) of the yarn style choices (Cotton, Cotton Ease, Crochet Thread, Microspun, or Organic Cotton), unless you are selecting 2 yarn types to create your camisole. If you are combing colors or styles, specify color and/or yarn style location (body, pico edging, bustline drawstring tie) for each color during checkout. We will follow up with you before creating your camisole.